The grueling landscape of Ladakh in India has been home to the people of Tibetian descent from ancient times. Ladakh is often referred to as Little Tibet owing to its rich Buddhist culture and history. There are many magnificent monasteries built across the territory of Ladakh which date back to the 7th Century. The Monasteries are famous not just for their awe inspiring architecture and traditions, but also for the breathtaking views they offer from the vantage points they are built at. No trip to Ladakh is complete without a visit to at least a couple of monasteries. 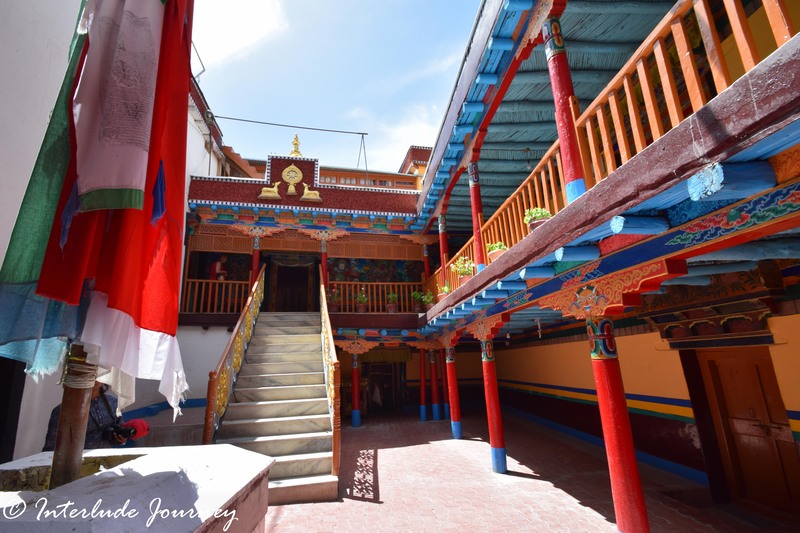 One of the monasteries that we visited during our trip was the Stakna Monastery which is located at a distance of around 25 km from the city of Leh. The first day of our visit to Ladakh was spent in our hotel, The Ladakh Himalayan Retreat, overlooking the Stok mountain ranges. Since we took a direct flight to Leh from Delhi, we had to spend a whole day in getting acclimatised to the high altitude. The Landscapes of Ladakh that we could see from the flight window had already enthralled us. 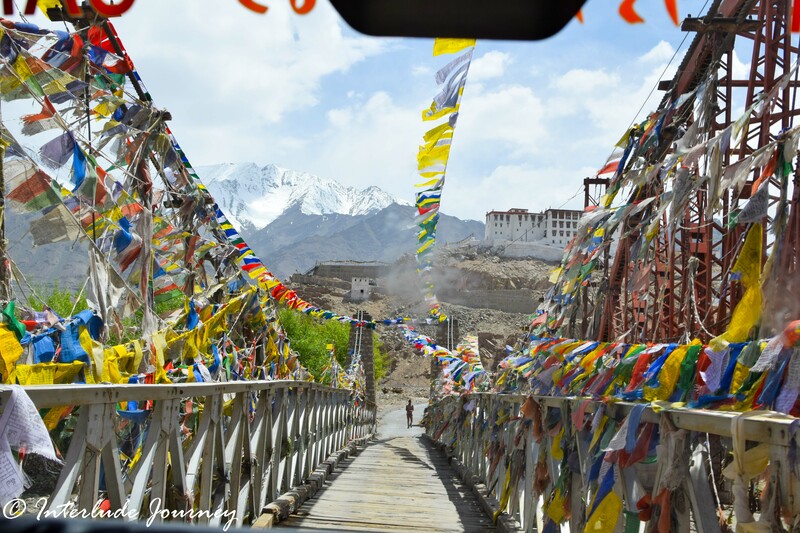 We could not wait to head out the next day to explore the areas surrounding Leh. After visiting the Magnetic hill and the confluence of Indis-Zanskar rivers near the village Nimmo, we headed towards the Stakna Monastery which was located on the other side of Leh. Ideally, one would get back to Leh from Nimmoo and then take the Leh-Manali highway and then cross a shoddy bridge to reach Stakna. To avoid the traffic and dusty roads in Leh, our driver suggested that we take a detour before Leh to cross over to the other side of Indus river. We were glad we agreed to change course because the land scapes changed dramatically on crossing the bridge across Indus. The moon like rocky terrain was gone and all we could see was lush greenery. The road we took meandered in the valley with Indus river to the left and the snow capped Stok ranges to the right. All through our journey to Stakna along the deserted road, we could see the city of Leh nestled between dusty peaks and the greenery in the valley. The towering popular trees and the yellow mustard fields were a sight to behold in the backdrop of the barren terrain. With the journey so beautiful, we were sure that the Stakna monastery set in such a location would be more captivating and we were so right. The word Stakna means Tiger’s nose. The Monastery is located on a small hill which is shaped like a tiger’s nose and hence the name. This 16th century Buddhist Monastery was founded by the Bhutanese saint Chosje Jamyang Palkar. There are about 30 monks living in the Monastery who follow the Drugpa Sect. Though the monastery did not look very attractive from the outside, the interiors were captivating. On entering the gompa, we could see a courtyard with beautifully painted wooden pillars. 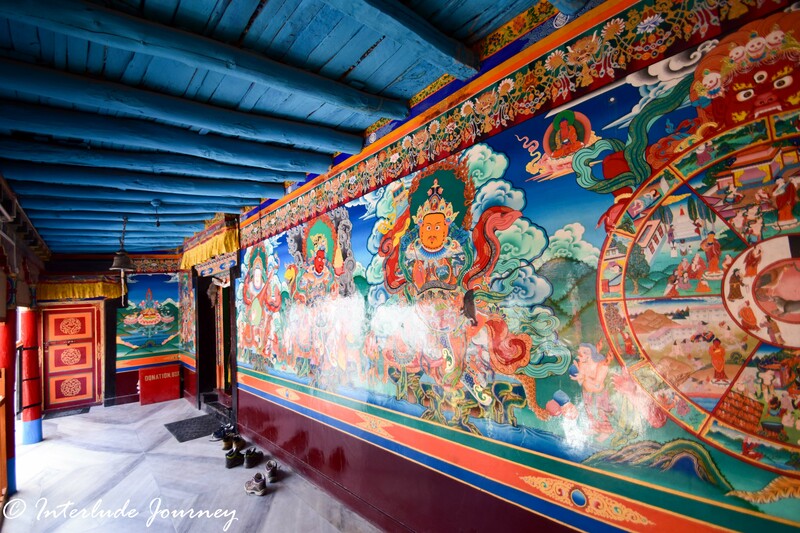 Most of the structure of the Gompa was constructed with wood and decorated with intricate paintings. The courtyard led to the main prayer hall called the Drukhand. The walls of the Drukhand were artistically done with colorful paintings of many Buddhist saints. The lavish use of base colors like red, blue, green and yellow along with gold was evident all across the monastery. Inside the main prayer hall, there were beautifully carved artifacts, idols, and bells made of bronze and silver. There were many seats made of velvet for the monks to pray and meditate. Photography was prohibited inside the main prayer hall. However, the chief monk took us to another prayer hall where some rituals were being performed. We were the only visitors to the gompa and all we could hear was the reverberating music of the drums and hum of the monks chanting. After clicking a few pictures of the prayer hall and having a short conversation with the monks, we headed to the roof of the monastery which had a Chorten. 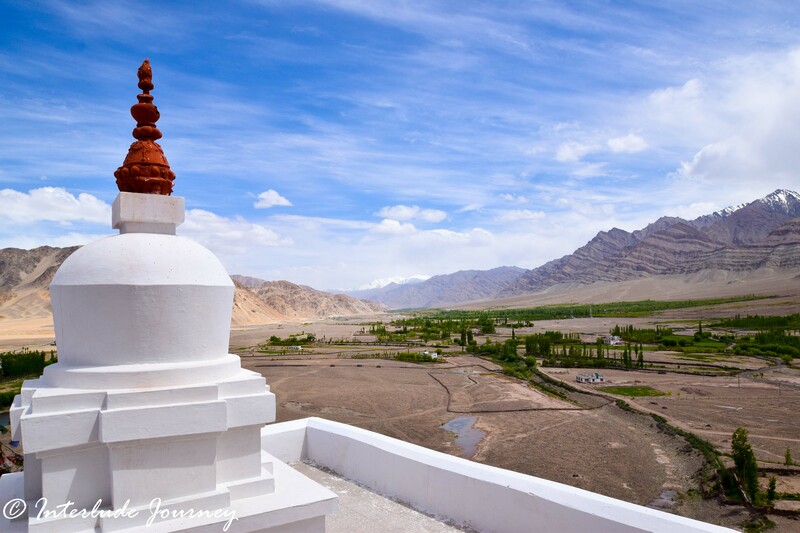 The best thing about the Stakna Monastery was the panoramic view of the Stok ranges, Indus river, the green valley and the barren peaks as seen from the monastery’s roof. Far across the Indus valley, we could also see the popular Thiksey monastery raising on a small hill from the green valley. 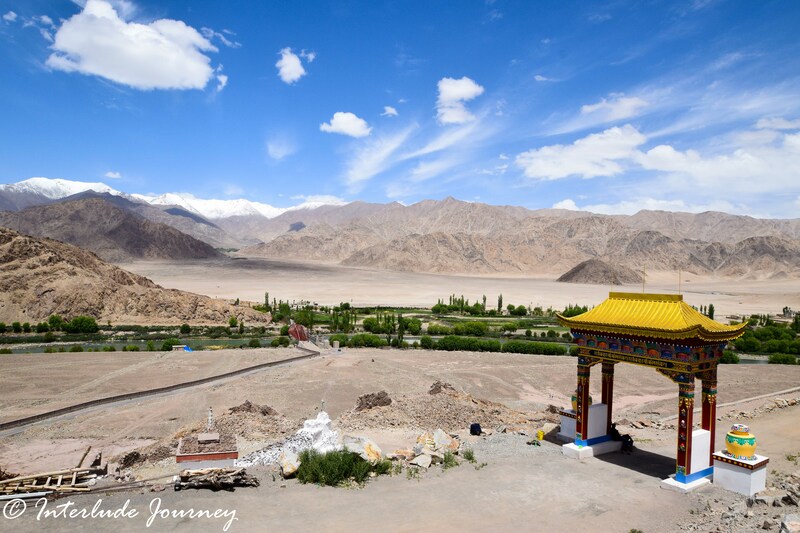 If you are looking of a less crowded monastery near Leh with a rich culture and offering beautiful views, Stakna is the one you should visit. Stakna Monastery is located at a distance of 25 Km from Leh and around 9km from Thiksey monastery. It is easily connected by road. 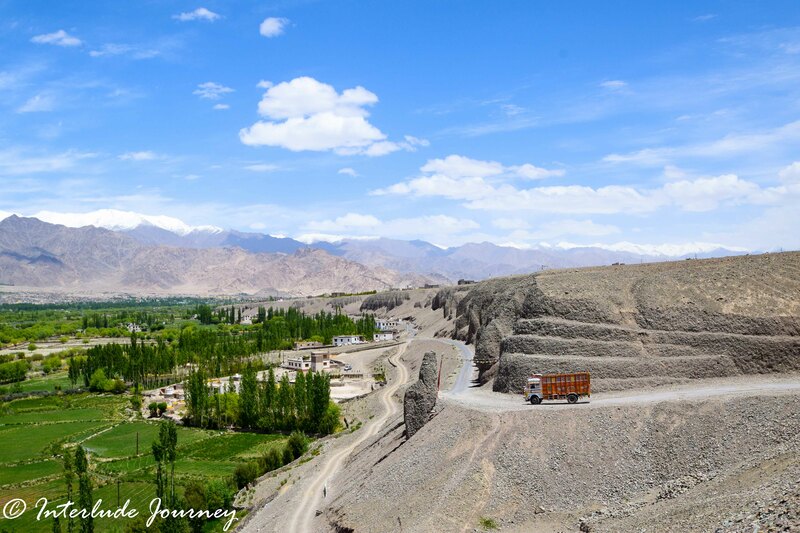 From Leh, take the Leh-Manali highway and take the right turn to cross the Indus river after the Thiskey monastery. 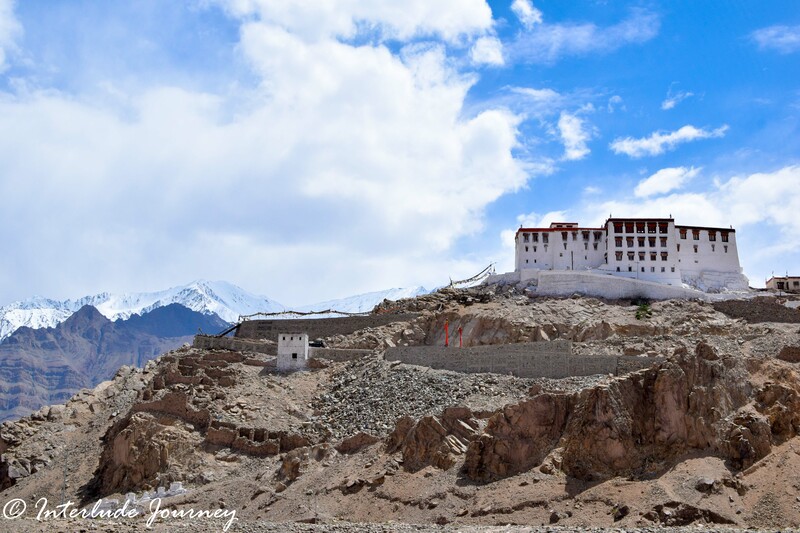 Here are a few things you should know before visiting the Monasteries in Ladakh. Photography is not allowed in some parts of the monasteries. Refrain from taking photos of such areas. Monks are sure a great subject for photography. But not everyone is happy to be photographed. So, take permission before you take their photos. Do not bribe the monks to pose for your pictures. Dress modestly while entering the monasteries. The monasteries are a place of worship. Make sure you remain calm and maintain silence. Do not spoil the sanctity of the monasteries by smoking and consuming alcohol. Most of the monasteries have clean toilets which are free for tourists. Do not pollute the area by relieving yourself in open. Women are not allowed into certain monasteries in Ladakh. Read upon any such restrictions before you plan your visit. Have you explored any offbeat monasteries during your visit to Ladakh? Let us know about your experience. Wow this monastery is gorgeous, just love all of the colors! I think it’s great you added tips to know before visiting monasteries. Research is incredibly important! OMG this monestary is stunning. Thanks for adding those tips at the end. Really helpful. Defs adding this to my bucketlist. OH WOW! That’s what sums up this post to me when I saw the photos. The monastery looks amazing and the landscape totally awesome! Now I want to check this out. Your right the inside of the monastery is amazing! I love all the color! So bright and festive! It is so unfortunate that I didn’t step inside the Stakna Monastery despite being in Leh for more than a month on two occasions. Your blog makes me realize what I have missed. I have seen the nearby dog sanctuary, Shey Monastery and Thiksey Monastery though. This is something that I shouldn’t miss when I visit India! The view with the snow capped mountains is breathtaking. SO BEAUTIFUL!!! So cool that you were able to take the pictures you did! Wonderful post and I love your recommendation to visit Stakna. This is absolutely stunning! I’ve been planning out must-sees on my trip to India, and this is now on it! I studied Eastern Religion in college and I know that this would become an instant highlight! The monk whom you photographed must be very friendly, all the monks that I had met were so ‘serious’ in the appearance that I never dared approached them. The pictures are FANTASTIC to say the least. Though I had been to Ladakh, I missed visiting the Stakna monastery. Lovely landscapes. 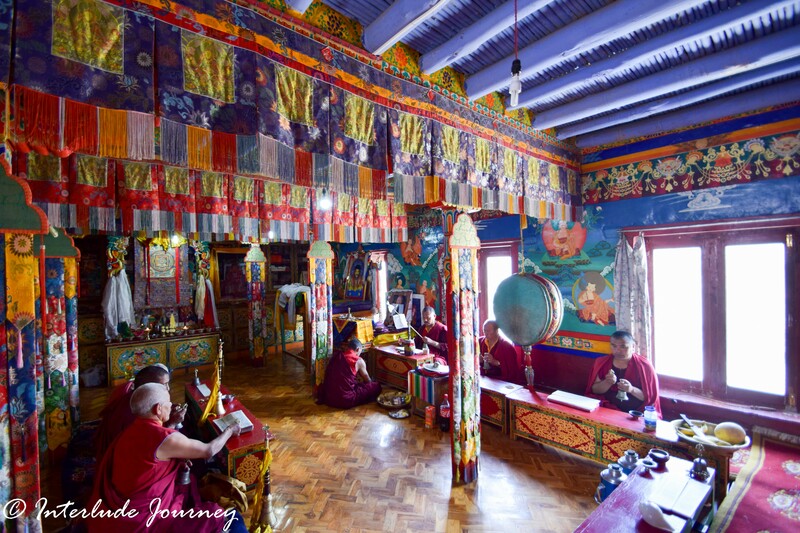 Nothing like a high altitude monastery to achieve peace and exhilaration at the same time! Wow, inside that monastery is amazing! Such beautiful paintings & decoration. And what gorgeous scenery too – there is something magical about mountains! I am always captivated by these kind of monasteries high up in the mountains. They are a complete world into themselves and I am always intrigued by the kind of life that goes on behind the doors of these monasteries. They have such a mystical aura that surrounds them. Stakna monastery seems to be a personification of these intriguing elements that I associate withe Buddhist monasteries. We’ve visited similar monasteries in Spiti and were always fascinated with them. You’ve captured the essence quite well, one more thing added to be done on our trip to Ladakh! I caught the bus from Leh (1O rupees) to Chogsumlar then transferred to the Thikse bus (2O rupees) which ended @ Stakna. Glorious, But I couldn’t find the iconic spot from which the photo of Stakna is taken. If I only had a car. Then I walked to Thikse.